Recently our daughter was invited to a sleepover birthday party. I know the parents very well, and didn’t hesitate at the invite. 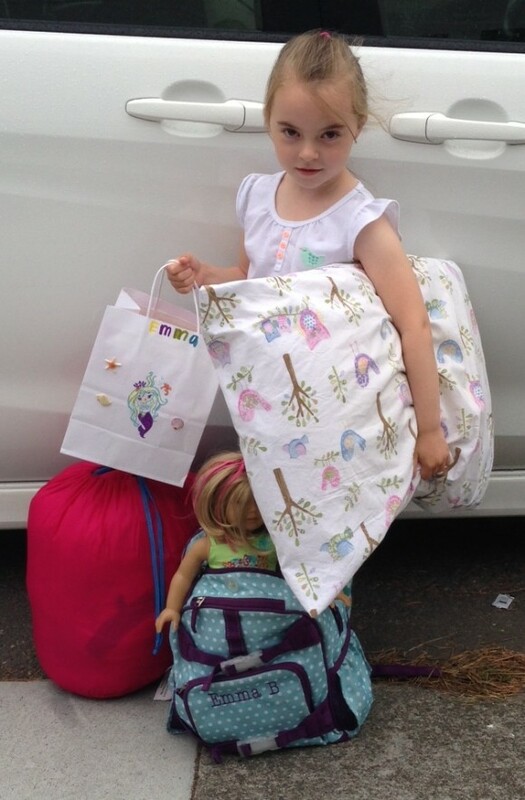 But I wasn’t sure if my daughter was actually ready for a night away from us. I didn’t know what the right age was for a first sleepover. Really, there is no right or wrong age. Only you know your child and how they handle themselves. Go with your gut to decide when the right time is for your child. After all, children are different. What is right for one 6 year old, may not be right for another 8 year old. When we got the invitation, I started talking to my daughter about the sleepover immediately. Leading up to the actual party, we talked about her anxiety and fears, along with the excitement she felt. If you have a sleepover invitation for your child waiting in your inbox, here are five steps to help determine if you and your child are ready for a sleepover. Get to know the host family first. I would never have allowed my daughter to stay the night at a home where I wouldn’t be comfortable myself. I knew the parents well, we had the same parenting philosophies and values. I didn’t have to worry about my child’s safety. I knew they would be well-supervised at all times, and would contact me without hesitation if a problem occurred. Make sure this is something your child really wants to do. Let them know it’s ok to change their mind. They don’t have to stay for the entire party, they can come home at any time. My daughter changed her mind several times before we arrived at the party. Each time I let her know that it was her decision, and she was allowed to change her mind. The thought of being away from home for one entire night can be stressful, and younger children may have an especially hard time with it. Listen and follow their cues leading up to (and the day of) the sleepover. Pack their lovey. Even if your child seems confident, packing something from home will give them an added sense of security. If they bring along their favorite stuffed animal or blanket, it’s as though they’ve brought a piece of home with them. We also had a sleeping bag for her that she usually only gets to sleep in for camping. So this was a fun way for her to realize she wouldn’t be sleeping in her own bed. Go over the list of people who will be there. Do they have any pets? How far away do they live? Going over these basics in advance will decrease anxiety. There were five girls total. My daughter knew three of the girls fairly well. She was even able to spend time with one of them the week prior to the sleepover. This also helped her feel connected to the girls before she attended the party. If you can, plan a playdate before the big day. If you are feeling uneasy in any way, maybe you should wait. Sleepovers can be a great experience if you and your child are ready. This is a great time for kids to experience another level of independence. It’s also a good time for parents to have a good long cry. You quickly realize that your child is growing up a lot faster than you want them to. All that being said, you still won’t know if your child is ready, or if you are prepared, until you both make it through the night. At my first sleepover, the other girls wanted to watch a scary movie. I got so scared my mom had to come pick me up. I didn’t last the night, but she didn’t make me feel bad about that. I always loved that. My son has been spending nights at friends houses for a long time, out of necessity when I have to go out of town for work or just for a date night and the friend thought it was easier to just have him spend the night. T doesn’t have any problems sleeping places that aren’t home. But you’re right. You have to work with your child and their comfort level. What’s right for one isn’t for another.